Great Combo-deal! Combine the Hop on Hop off Bus with a visit to La Sagrada Familia and save time and money! Hop on the Barcelona Bus and discover all the highlights that make this Mediterranean city so special. From the Modernist Buildings and the great cuisine, right through to the Olympic city and the Mediterranean sea: it's all Barcelona! The Open-top double decker bus will take you there. With the Audio guide in 10 languages and individual headphones, all you have to do is hop on, listen and enjoy! Hop on and off as many times as you want between the three tour routes at 44 different locations. It can be very busy at the ticket offices, so buy your ticket online now and hop on at the location of your choice! Your ticket for the Hop on Hop off Bus is valid for one day. This ticket offers you the possibility to Skip the Line at La Sagrada Familia. 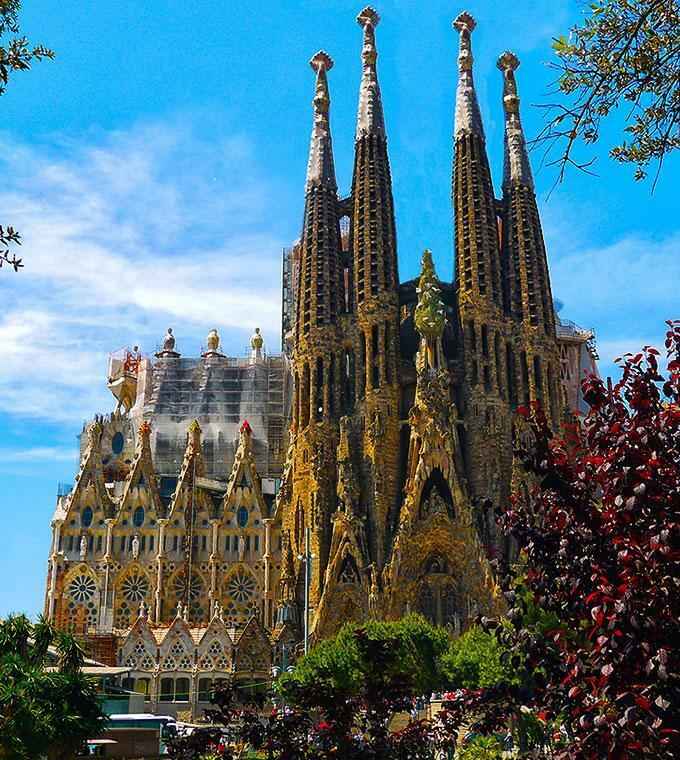 This famous large Roman church is designed by architect Antoni Gaudí from Catalonia. The construction of the church began in 1882 but it was only 1883 when Gaudí became involved and combined the Gothic and Curvilinear Art Nouveau forms. Nowadays the Sagrada Familia is an UNESCO World Heritage site, and in November 2010 it was consecrated and proclaimed a minor bascilica by the Pope. October to March, 9 a.m. to 6 p.m.
April to September, 9 a.m. to 8 p.m.
25 and 26 December – 1 & 6 January, 9 a.m. to 2 p.m. Please note: the Sagrada Familia will be closed on the 23rd, 24th and 25th of September in the afternoon. For La Sagrada Familia (includes a guide in English) you can select morning or afternoon tickets, an exact timeslot will be given after your reservation. Tickets will be sent within 24 hours. Please make sure you are on time!